Morphy Auctions’ May Las Vegas Coin-Op and Advertising Sales Event To Feature The Most Outstanding Range Of Antique Arcade, Vending, and Gambling Machines To Come To Auction In Recent Memory. This 1,500-lot auction follows closely on the heels of the company’s January 2016 $3.4 million sale and features an extraordinary selection of machines consigned directly from private collections across the United States and Canada. 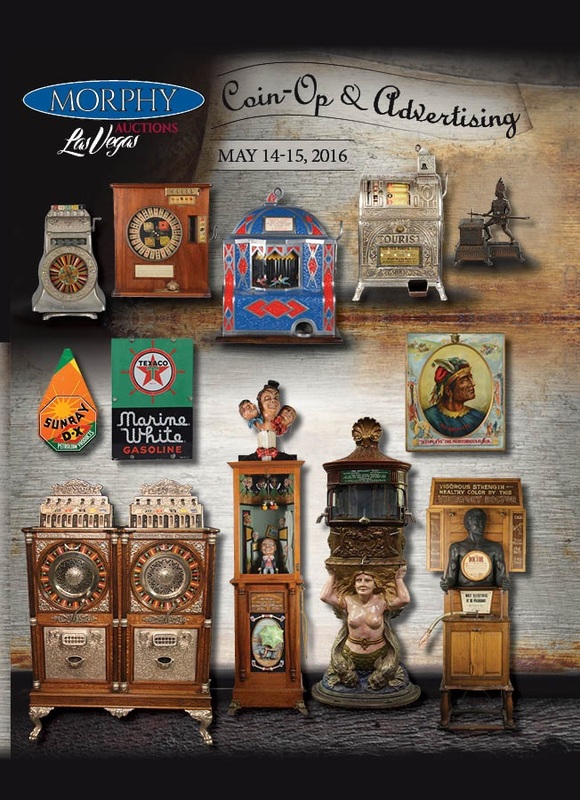 Morphy Auctions, the finest auction destination for fresh to the market collections, is pleased to announce its multi-million dollar Las Vegas Coin-Op and Advertising two day sales event to be held on Saturday, May 14th and Sunday, May 15th, 2016. All lots from this auction will be on display in Morphy’s Las Vegas auction gallery and available for preview starting April 1st. It is all fun and games when it comes to this auction’s incredible selection of antique arcade machines. A circa 1920 Fey Two Player Electrofire game – designed to operate at a distance of 16 feet between the guns and target – is no longshot to meet its $40,000-50,000 estimate. This rarity has been expertly restored by Andy Parnell. A Two Player Mermaid Gun Game – which returns the coin to the first player who knocks down all of his opponent’s riflemen – is estimated at $150,000-$175,000. It’s no fish tale that this example, in excellent condition, is one of only a handful in existence. And there’s certain to be plenty of gawking at a 1 Cent Mills Rubberneck Lung Tester, estimated at $50,000-60,000. Tim Laganke professionally restored this breathtaking example based on original catalog photos. Collectors will also want to drop a dime on this sale’s amazing offering of antique slot machines. A 5-cent Caille Peerless Roulette Machine, in mint original condition, will turn a few heads with its $175,000-200,000 estimate. This model has fewer pay spaces than later ones, adding to its rarity. A 5-cent Caille Tourist Cast Iron Slot Machine is the reel deal and is estimated at $20,000-30,000. This first class example is in remarkable, untouched, all-original finish condition. And an incredible, early 20th century “California” 5-cent Poker Machine will give collectors a gold rush. This machine, made by an unknown manufacturer, has a most unique appearance as well as mechanical play action and is only one of three known examples. It is estimated at $25,000-45,000. Morphy’s May Premier Coin-Op and Advertising Sale will also share a bit of “lady luck” with the local Las Vegas nonprofit community. All proceeds raised from the sale of four working, collectible pinball machines will go directly to the Las Vegas based Pinball Hall of Fame and the various charities – including the Salvation Army – it supports. The machines on offer include fine examples of Pennant Fever, Twilight Zone, Joker Poker, and Travel Time. The Pinball Hall of Fame features 1,000 working pinball machines and is a family friendly, hands-on museum dedicated to celebrating the fun, history, and nostalgia associated with this popular arcade game. Morphy’s is proud to partner with the Pinball Hall of Fame on this project. Morphy Auctions, Las Vegas is located at 4520 Arville Street, Las Vegas, NV 89103. We can be reached by phone at 702-382-2466, by fax at 702-382-6513, and by email at info@morphyauctions.com. Our Las Vegas gallery is open Monday through Friday from 9:00am-4:00pm. For more information on Morphy’s, please visit www.MorphyAuctions.com.